Quiet, discreet and compact the Swing electric breastpump combines multi-award-winning design with the latest technology to bring busy mums a great solution to breast pumping. Having scooped a Which? Best Buy Award, the pump is extremely popular as it helps mums express milk quickly and comfortably. 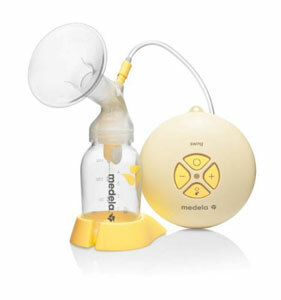 Thanks to Medela’s 2-Phase Expression Technology the breastpump simulates the natural infant sucking behaviour at the mother's breast. Expressing milk with the Swing feels just like breastfeeding, fast and light at first and then slower and deeper as the pump mimics the way baby feeds. The Swing’s faster let-down and maximum milk flow reduces pumping time, giving back busy mums some precious free time! Apart from saving time, the Swing is a practical and comfortable way of expressing milk, as mums can switch between the 2 phases themselves and set the vacuum level to suit their needs. The pump can simply be plugged into the wall, or used with batteries and a belt-clip so mums can move around freely whilst expressing. The Swing is compact and light, so it won’t be difficult to carry round the home, or whilst out and about. Mums can personalise their Swing pump by using the individual adjustable Personal Fit Breastshields to make sure they get maximum comfort while they express. The Swing is BPA free, and easy to clean. Even better, the pump now comes with a free Calma feeding device to ensure a smooth transition between breast and bottle and back again.